Z axis problem. Is this a problem with the motor or the driver? I have owned this printer for about 2.5 years now and this problem just started today. There is a problem with my Z axis either with the motor or perhaps the electronics board (failed output transistor maybe?). There are two problems. When controlling the Z axis with simplify 3d, hitting the same movement button (in the below video, -10) the axis goes either or down, randomly, when it should obviously be moving in one direction. Second, as you can see in the video, it gets stuck sometime and doesn't move but instead spudders. This is making me more lean on the electronics being bad, but the random up and down movement doesnt make any sense. Anyone care to suggestion anything else I can do to better diagnose? Re: Z axis problem. Is this a problem with the motor or the driver? It's what happens when a stepper is mechanically overloaded: the rotor can't turn at the commanded rate. If it continues to stall, reduce the Z axis speed by a factor of four. If that solves the problem, then perhaps you tweaked the speed while you were fixing other problems and never noticed. Thanks for the info. I already cleaned the rods a bit but I'll try again to clean and lube them better tonight tonight. I'll also try to reduce the Z speed and see if the problem clears up. I'll update tonight. Actually quick question. What is the technical reason why the motor would move in the opposite direction if it's mechanically overloaded? The windings set up a rotating magnetic field which, in normal operation, drags the rotor around with it. When the rotor stalls, it vibrates back-and-forth and may wind up synchronizing with the field in the wrong direction. Old Western movies had a similar problem with wagon wheels turning faster than the frame rate and looking like their spokes rotated backwards. The stepper may emit horrible sounds, but stalling doesn't do any damage to the motor or its driver. 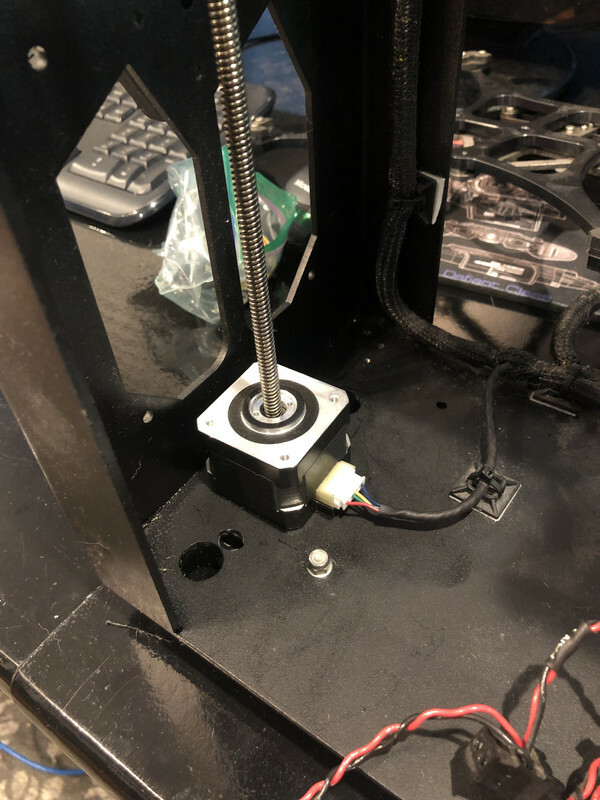 I have completely dissembled the Z axis down to the motor and the ball screw rod so the motor will completely be unloaded. Cleaned the rod near the motor a long with applying a bit of lubricant. It seems like the motor pretty much behaves the same way. For each +10z movement the rod will spin in a random direction, and randomly get stuck. It seems like the problem has no bearing on the mechanical load or the motor being dirty. Any other debug ideas? More likely this is a problem with the motor itself or the electronics? Also, I tried playing with the Z speed, doesn't really make a difference, same problem is still there higher or lower speeds. 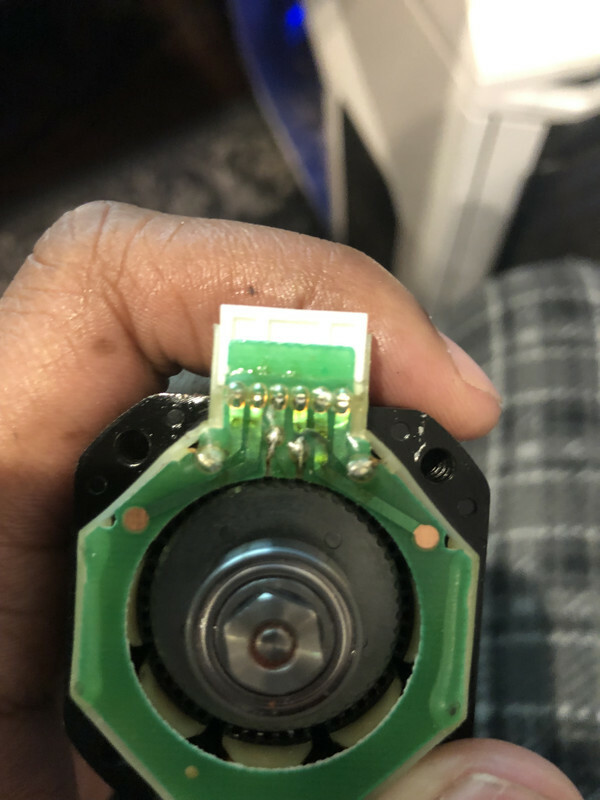 Also, I dont know if this it relevant but a very low speeds (less than 5mm/sec) the motor just studders and cant turn at all. So I got a little curious so I took the bottom of the motor apart and these electrical connections look suspect. Is this normal? The PCB traces look mangled and warped. No sugarcoating: disassembling a stepper demagnetizes the rotor. You must buy a new Z-axis motor. The motor is assembled with the rotor demagnetized, then it's magnetized in place. When you take it apart, the rotor smacks into the stator, which creates a localized high-density magnetic path between the rotor poles. The rotor poles can't support the high flux and demagnetizes. You can put the motor together and it will "work", in the sense that the rotor will go around, but the decreased magnetic field reduces the torque for a given winding current. You can't increase the winding current, because the motor will overheat. There's a conformal coating over the whole PCB to prevent corrosion, so what you see is perfectly normal.